This is actually a question we had after reading about a pet store was selling "certified Salmonella-free turtles" illegally. We have shared skepticism on the topic before but thought the issue was worth a second look. Certainly, US turtle farmers are touting a turtle egg treatment as a means of making pet turtles "safe" again, thus negating the need for the ban on sales of turtle hatchlings. So, are ​Salmonella-free turtle hatchlings the wave of the future? From research we've read, we believe it may be possible to produce a Salmonella-free turtle egg (and hatchling), but it is difficult to keep them Salmonella-free in the long term. Furthermore, turtles only shed Salmonella intermittently, so a negative test is unreliable. A secondary concern is the accidental production of antibiotic-resistant Salmonella instead. When the ban on sales of turtles under four inches was first enacted, researchers scrambled to find a method to eradicate Salmonella bacteria from eggs and hatchlings. A method was developed that involved treating turtle eggs with disinfectant to clean them followed by a dip in an antibacterial solution. A difference in pressure is created which drives the antibacterial solution into the egg, killing any Salmonella bacteria that are present in the egg. Turtle farms have been using this method (often called the Siebeling method after the scientist who did much of the research) to produce certified "Salmonella-free" eggs and hatchlings for export. However, some less scrupulous sellers are marketing these certified "safe" hatchlings within the US, in contravention of the ban. Cases have been documented where "Salmonella-free turtles" turned out not to be Salmonella-free, after all. But even the original research stated that a small percentage of treated eggs/hatching were not free of Salmonella. There is also a lack of recent peer-reviewed research to prove the efficacy of the procedures used to produce Salmonella-free turtles. The nature of Salmonella infections in turtles: turtles are natural carriers of Salmonella (part of their normal bacterial load in their intestines; they do not get sick from it). Although they often carry Salmonella, turtles do not constantly shed the bacteria in their feces, so even a turtle carrying Salmonella can give a false negative test depending on the timing of the testing. And, because Salmonella is survived pretty well in the environment and turtles are natural carriers, a Salmonella-free turtle can easily become re-infected, especially around other turtles. Antibiotic Resistance: when antibiotics are used, most bacteria will be eradicated, but any bacteria that happen to be resistant to the antibiotic survive and multiply, resulting in antibiotic-resistant bacteria. In the past several years, Gentamicin was the antibiotic commonly used in the procedure to produce Salmonella-free turtle eggs. Ultimately, turtles were found that harbored Salmonella and other strains of bacteria that were resistant to Gentamicin as well as some related antibiotics (Plasmid-Mediated High-Level Gentamicin Resistance among Enteric Bacteria Isolated from Pet Turtles in Louisiana). This only makes the situation worse, since bacterial infections resulting from turtles carrying resistant strains could be harder to treat. So, the hunt is on for another treatment to which resistance can't develop. The Food and Drug Administration, who enacted the ban, has not approved the process, mainly because of the use of antibiotics (and concern over resistance) and because reinfection is possible. Careful hygiene is a good rule to follow with any pets. 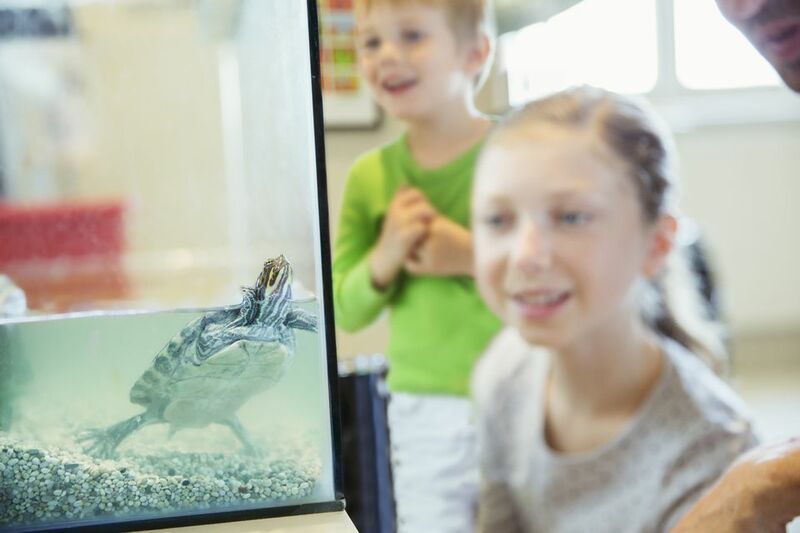 Our concern is that owners of Salmonella-free turtles may not be as careful, thinking their turtles are safe (unaware of the chances of reinfection, or other bacteria their turtle could carry). We don't think Salmonella should prevent people from getting reptiles, but respect for the risks makes them safer. What If the Ban Is Lifted? What we found astounding is that, according to the study cited above, 12 million hatchlings a year are exported. 12 million! As turtle farms become more established in Asia, US turtle farmers are again losing their market, and they want the US market opened up again. Before the ban, when baby turtles were hugely popular and very widely available, many turtles perished in the hands of well-meaning owners who knew little about their care. Even today, turtle hatchlings are sold (albeit illegally) along with ridiculously inadequate plastic lagoons as homes. However illogical the ban on turtle hatchling sales might seem, it has had a good side effect of saving hatchling turtles from death due to neglect. Well, maybe not; We suppose the problem has just been exported, and the sale of hatchlings in the US may have been slowed down, but not stopped. Still, We are afraid if the hatchling market opens wide in North America again, it certainly won't benefit the turtles.